Looks like they found a half-monster instead of a monster-monster! Probably not the best person to get angry! Well the time has finally come! I'll be moving to college on Sunday! I've been getting packed and gathering things together all this week. You might of noticed already due to delayed updates that I don't have the buffer I said I was going to build. I've been working on a site redesign for awhile now instead, and the recent coffee shop menu design gig took time too. So next week there won't be a new page. Instead I'll give you an update next friday on things and see when I can get a new page out once I'm settled in college. I have a tumblr you can follow me on if you want to keep up to date with me. 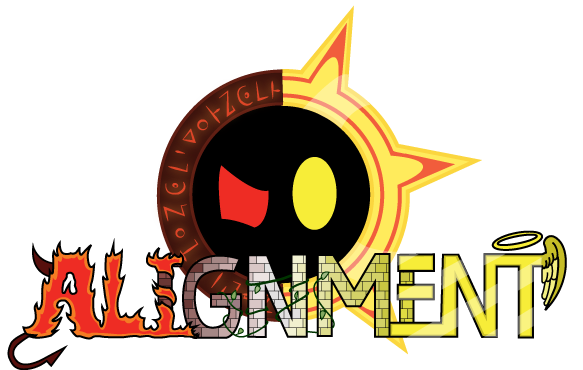 I'll probably post pictures and bloggy tid-bits there that aren't entirely related to Alignment! The blog's link is in the navigation bar up top (cleverly disguised as "blog")! Or you can click here! No new Re-Bubble today! It seems like my average rank is around 400 judging by this month. I'm thinking about postponing Re-Bubbles until the new website design is released. Thanks for all the votes so far, everyone! I'll still leave a link here though! Thanks for reading! See you next Friday for an update of sorts! What happened to Skirmish? Behind the curtain...maybe? No, Skirmish IS the curtain! Master of disguise, of course! Ugh, humans are so annoying. Goredamn is a handful and a half! Mhm you are so right. this is totally amusing - never cared for the "extra" races. most of my players just wanted to abuse them for min maxing. *sighs* there were many beatings. Ah, thats the opposite of my usual tabletop games! Usually everyone takes a common PC race like elf or human. I'm the one who takes something crazy like kobold! 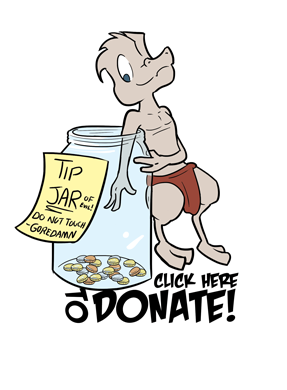 Though granted, kobolds are more "min" than "max" compared to other races! To be fair, most players when they play a tabletop RPG are going for Rule Of Cool. Power = Cool as far as they're concerned, so More Power = More Awesome. You can usually tell the problem player early on. Its the one that decides their character is going to wear body armor on bowling night. The intro to the campaign hasn't even started yet....sheesh. "If it hadn't been for Tom and co.
Where'd you come from, Kobold?" Good gooood! Now we must commence step 2! Half Dragons are cool. You guys shouldn't call them names. You still retain the title of "Oracle of Alignment". You'd be surprised how many do call them names. Being the newest race and connected with monsters, adventurers aren't too keen of them! So the half dragons finally appear. And they look NEAYT. Anyone notice the moon tatoo? Wooot! You recognized the tattoo! Soon, you'll be seeing a sun tattoo half-dragon later on as well as untattoo'd urban ones. Someone coulda gotten hurt in that situation. But I guess the archer, (Gerald I believe, or maybe Tom...) seems to already be hurt. He got a little ahead of his headstrong comrade and headbutt his forehead into the metal head helmet heading his way! In other words, they dun goofed. I wonder where that arrow went. Thanks! Expect more of them to start showing up! Aaah! You know a sound is brutal when it has the KER- particle! But the important question is: is he half-dragon from the mommy side, or the daddy side? The Monster Manual magically gives humans the dragon gene offspring. THERE. You people and your imaginations!